Named after the two-faced god, newly developed Janus nucleic acid recognition elements target double-stranded DNA or RNA by engaging both strands at once. When strung together within a single-stranded protein nucleic acid (PNA), a synthetic construct, Janus elements may bind to natural targets in a sequence-specific manner. 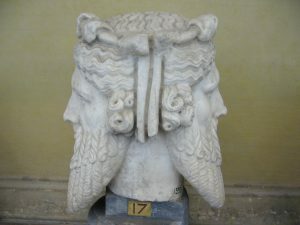 What’s more, Janus elements, like Janus himself, looks backwards and forwards at the same time—backwards to a series of recent PNA improvements and forwards to newly opening possibilities in gene editing and the regulation of gene expression. The Janus elements have been developed by an international team of scientists led by Danith Ly, Ph.D., a professor of chemistry at Carnegie Mellon University. Previously, Dr. Ly led efforts to develop gamma PNAs, which incorporate a polyethylene glycol group on the side chain. This innovation makes gamma PNA water soluble and biocompatible, which means that it doesn’t bind to proteins and other biomolecules in a nonspecific manner. In addition, the specific stereochemistry of the polyethylene glycol group pre-organizes the PNA into a right-handed helical motif, making it bind to DNA more readily. Consequently, gamma PNAs can be programmed to bind to the genetic material (DNA or RNA) that causes disease, allowing them to search for detrimental sequences and bind to them to prevent a gene from malfunctioning. In new work, the team led by Dr. Ly has pushed gamma PNA to a new stage of refinement, the Janus gamma PNA, which includes Janus elements capable of bifacial recognition. The concept of bifacial recognition was first conceived more than two decades ago by Jean-Marie Lehn, Ph.D., a Nobel laureate known for his work in the field of supramolecular chemistry, and it has since been expounded on by other researchers in the field. The advancement of this research has been held back by two obstacles. First, researchers had been able to only make a small number of Janus bases, and those bases varied considerably in shape and size. These limitations meant the different Janus bases could only recognize repeats of the same set of base pairs and couldn’t be used together like building blocks to recognize more complex sequences in DNA or RNA. Second, it was difficult to synthesize Janus bases for canonical base pairs. The complementary nature of the two sides of Janus bases made the molecules hybridize and bind to each other, preventing them from incorporating into DNA and RNA. 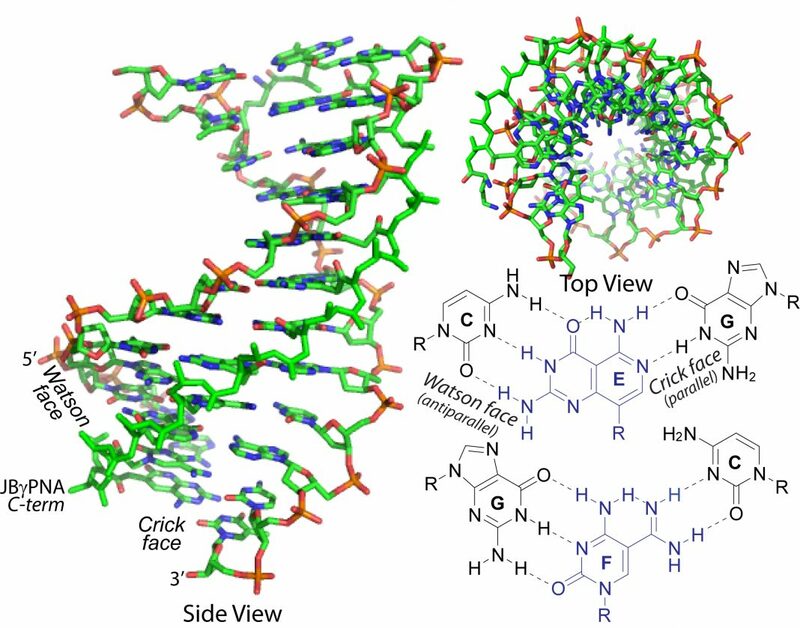 These obstacles have been overcome by Dr. Ly’s team, which has published its findings in an article (“Shape selective bifacial recognition of double helical DNA”) that appeared recently in the journal Communications Chemistry. Dr. Ly and colleagues created 16 bifacial nucleic acid recognition elements to interface with every possible combination of nucleobases (canonical and non-canonical) that could be found in the genetic code. The Janus gamma PNAs can be used to recognize any combination of base pairs and mixed and matched to detect and bind to complex genetic sequences. A postdoc on Dr. Ly’s team, Shivaji Thadke devised a novel solution- and solid-phase synthetic method to develop the Janus gamma PNAs. He also deployed a trick inherent in the helical preorganization in the backbone of the gamma PNA to prevent self-complementary Janus bases from hybridizing to one another. They do this by taking advantage of when double-stranded DNA and RNA molecules “breathe” and the bonds between the base pairs open for fractions of a second. When this happens, the Janus PNA inserts itself between the separated strands. If the base pairs don’t match up, the Janus PNA is ejected from the DNA molecule. But if they do match, the Janus PNA binds to both strands of the molecule. Janus gamma PNAs have a wide range of biological and biomedical uses. They can be designed to target genomic DNA for gene editing and transcriptional regulation. They also could be designed to bind sequence-specifically and selectively to the secondary and tertiary structures of RNA, something that traditional antisense agents and small-molecule ligands aren’t able to do. For example, the Janus gamma PNAs could be programmed to bind to RNA-repeated expansions, which could lead to new treatments for a number of neuromuscular and neurodegenerative disorders, including myotonic dystrophy type 1 and Huntington’s disease, or to noncoding RNAs, including pathogen’s ribosomal and telomerase RNA, to combat genetic and infectious diseases.